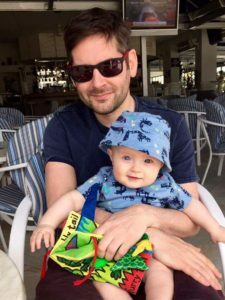 Meet Later Dad Matt Coyne (Interview by Robin Gorman Newman) | MotherhoodLater.com - World’s leading website, eZine and community for midlife moms. 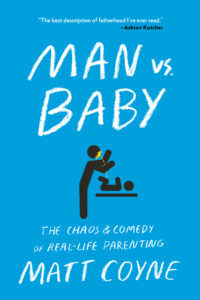 I’m the creator of the parenting blog Man vs Baby and author of the bestselling book ‘Man vs Baby, The Comedy and Chaos of Real Life Parenting’ which is now available in the US. Visit www.facebook.com/manversusbaby. What was your road to parenthood like? Unpredictable. Me and Lyns had been together for about 15 years before we even talked about having kids. Weirdly, it just didn’t come up that often and as we got older I think we both just kind of assumed that we wouldn’t have any. Then my dad got ill and that made us see things a bit differently. It made us think more about parenthood and what it meant. And when he died we talked about it a lot and came to the conclusion that being a mum or dad was a pretty impressive thing to be. And so we decided to try for a baby. We thought this would be straightforward. When you’ve been careful not to have a baby as long as we had you assume that standing near each other without protection will lead to instant pregnancy. For us that wasn’t the case. And so for 4 or 5 years we dealt with fertility issues, loss and sometimes brutal sadness. But then Charlie landed into our lives, like a tiny, perfect hand grenade. And, he was worth the wait. When you became a “later” dad, what did it feel like? It’s weird, it never occurred to me that I was a ‘later’ dad. Until it was pointed out to me. A lot. I was 40 when we found out we were pregnant and I guess that’s pretty old for a first time dad but some people talk about 40 as though it’s ancient. They reacted as though I was the same age as Yoda and I was sitting at home watching ‘Murder She Wrote’ with a blanket on my legs, banging on about World War 2. I didn’t feel that old, I still don’t. How does being a dad influence your work? Being a dad has definitely made me more creative. I suppose I was in a bit of a rut before Charlie came along. But there’s something about having a kid that wakes you up. You start to see things from a brand new human’s point of view. And babies see everything from a sunset to a trashcan with complete wonder. It’s impossible not to feel more alive and creative when they’re around. What do you hope readers will take away from the book? I really hope they read it and find it funny and heart-warming. But also, if they are worried about being or becoming a parent I hope they feel empowered. I am the most clueless, inept, immature and hopeless individual who has ever found themselves in charge of a tiny human. If I can do this parenting thing.. You’ll be fine. What advice would you offer to multi-tasking, overwhelmed “later” moms and dads? Lower your expectations and go with the flow. I went to a talk given by a parenting expert in which they talked about how parents need to learn to swim against the tide. The tide of tiredness and tantrums and all that stuff. But I’ m not sure about that. I think it’s better to be a boat. Sometimes you need to sail against the tide but sometimes you need to let the current take you where it takes you. With kids on board, there is always a mutiny and sometimes it feels like you’re sinking. But you’ll get there. Battered, taking on water and with a possible outbreak of scurvy. But you’ll get there. Do you think it’s tough to balance parenting, a personal life and professional pursuits? I think its incredibly difficult to get the balance right. 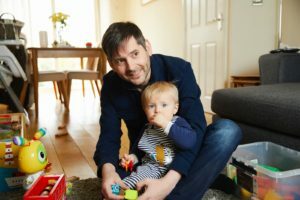 It’s easy to find your personality swallowed up by being a parent because its really difficult to carve out time to remind yourself who you are outside of being ‘mum’ or ‘dad’. But I have a pretty healthy approach to my work. I’m not a brain surgeon or a firefighter. So work can usually wait, no one is going to die if I take the day off. What do you see as the positives and challenges of having a child at age 35 or over? I think there are advantages to being an old dad. We enjoyed our time as a couple before we had Charlie. We travelled a lot and had a hell of a good time. So now I don’t feel like we’re missing out on anything by being parents. Then again, young parents have the advantage of energy and stamina and when the night feeds start to take their toll they probably feel marginally less like death. Has anything about being a father surprised you? If so, what? What do you love the most about it, and what is the most challenging? I miss being able to do nothing. That’s the biggest challenge. being able to sit down when you feel like, put your feet up and have a beer, just because you feel like it. I think the biggest surprise is how much I’ve changed. In some ways for the better, in some ways for the worse.. But the main way in which I’m changed is that I’m happier. It sounds daft to put it so simply. 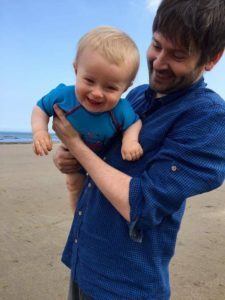 But, when charlie made his entrance two years ago now, and we eyed each other suspiciously for the first time, I wasn’t expecting to be quite so taken with our little human. I didn’t realize that I would become so superglue attached, or quite so enthusiastic and proud when he laughs or waves or does something else, that objectively isn’t that earth-shatteringly impressive but feels like it is. I’m a better person for him existing and I really wasn’t expecting that. What did you most want to teach your son? What have you learned from him? I want to teach him to be fearless. To think for himself. To be kind. As for what Charlie has taught me, I’m just writing an entire second book about exactly that, so it’s difficult to know where to start. He’s taught me that we forget things as we get older. Things that are really important.. stuff about being foolish and unconcerned about what other people think, that sort of thing. There’s that old saying about how you should dance like no one is watching.. but two year olds dance like everyone is watching they just don’t give a sh*t. Charlie is re-teaching me the art of this. Did your parents offered any particular parenting advice that really resonated with you? My mum gave me a great piece of advice about being a parent: “Stop and look up everyone now and again. One moment they are crawling.. the next you are getting a call from police to say that your 15 year old son has been caught smoking a joint whilst sitting on the hood of his friend Dean’s car”. (Even when imparting parental advice to me as a 43 year old man.. My mum never misses an opportunity to remind me of this incident). What words of wisdom would you like to share for someone contemplating fatherhood over age 35? Do it. It will be the hardest, dumbest, most frustrating and beautiful thing you will ever do. And since when did age stop us from doing hard, dumb, frustrating and beautiful things?